Crack monitoring gauges are one of the simplest ways to monitor movements in building and structures. 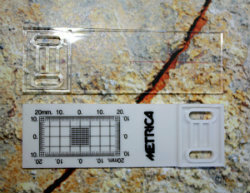 The basic tell-tale crack monitoring ruler monitors horizontal and vertical movement across a crack on a flat surface. The crack monitor device is made of polycarbonate. Reading accuracy of +/- 0.5 mm on grid.